On 11 September 1952, the Ethio-American conspiracy against the Eritrean people, resulted in the Federal Act and Ethiopia annexed Eritrea. The United Nations ignored the plight of the Eritrean people. Resolution 390A(v), was a violation of basic human rights of their rights under the UN Charter. The Eritrean people were forced to embark on a 30-year armed struggle when their calls for justice landed on deaf ears. During the war for national liberation, the superpowers supplied arms to crush Eritrea’s right to self-determination, and the United Nations once again looked the other way as atrocities were being committed against the people of Eritrea. During the last years of the struggle, the United States tried to scuttle prospects for a peaceful resolution, proved once again that it was not ready to accept an independent Eritrea. The victorious Eritrean People’s Liberation Front (EPLF) entered Asmara, the capital of Eritrea, on 24 May 1991. Two years later, the Eritrean people voted in the Referendum and Eritrea joined the UN on 28 May 1993. During the Eritrea Ethiopia border conflict in 1998-2000, US mediators appeased the minority regime in Ethiopia at every turn and were responsible for escalating a seemingly small border issue into a full blown war that cost the lives of over 120,000 Ethiopians who were used as cannon fodder and minesweepers in Ethiopia’s aggressive war of expansion. The United States provided Ethiopia diplomatic, military, and political shield and support. Once again it is misconduct, political machinations by the powerful states, and political pressure that led to the violations of the rights of the Eritrean people. The US brokered and its lawyers authored the Algiers Agreements signed by Eritrea and Ethiopia in December 2000, bringing an end to the border war. An independent Eritrea Ethiopia Boundary Commission was established and it rendered its final and binding delimitation decision on 13 April 2002, and the EEBC awarded Badme, the casus bellie for the conflict to Eritrea. Ethiopia rejected the final and binding ruling and 12 years later, it continues to occupy Badme and other sovereign Eritrean territories. The United Nations at the behest of the United States and its allies, failed to uphold an internationally endorsed border decision delivered by the independent Eritrea Ethiopia Boundary Commission. In 2009, once again at the behest of the United States, the US-Ethiopia engineered illegal, unfair and unjust sanctions resolutions were adopted against the State of Eritrea and its people. A reminder of yet another ugly mark in Eritrea’s history with the UN System. All these hostile actions, of using the UN system to advance illicit agendas against the State of Eritrea have undermined the credibility and integrity, most importantly, the efficacy of the world body. Beyond states, individuals have also been engulfed in the ugly shenanigans against the State of Eritrea, careers have been compromised, and in some cases, brought to an abrupt end. A “regime change” agenda was exposed in a letter written by Dinesh Mahtani, member of Somalia Eritrea Monitoring Group (SEMG). Today, we see many cases of wrongly convicted individuals being exonerated through DNA evidence. Wrong convictions have many causes. Some examples are eyewitness misidentification, junk science, false confessions, government misconduct, bad lawyers and snitches. In a court of law, the victim is usually compensated for the wrongful arrest and conviction. Some are set free when the evidence is considered to be too weak to convict. Unfortunately, the rule of law is almost nonexistent at the UN-as it is at the mercy of the powers to be. Time and again states and peoples have had to endure great suffering caused by wrongful resolutions adopted by the UN Security Council. Lives have been destroyed and nations brought to the brink of disaster. The illegal, unfair and unjust sanctions resolution adopted in 2009 against the State of Eritrea is an example. In the post September 11 atmosphere, the US used its power and influence and used the “global war on terror”, as a pre-text to violate the sovereignty and territorial integrity of states. Somalia was one of its victims and the US partnered with Ethiopia to launch a war of invasion and occupation that has devastated Somalia and created the greatest humanitarian disaster in that nation’s history. Eritrea was targeted for punishment for not subscribing to Washington’s policies for Somalia. Eritrea was labeled a “spoiler”. “…Eighty percent of ammunition available at the Somali arms markets was supplied by TFG and Ethiopian troops …’. The monitoring committee received details of some 25 military flights by Ethiopia into Somalia and knew that Ethiopian troops had brought military equipment into the country to arm ‘friendly clans,’ …’Somalia is affected by a war economy, with great profits made by military commanders, who therefore have little incentive to change the status quo’. … Kumalo said the Somalia sanctions committee backed the idea of independent investigations of Somalia’s TFG, the Ethiopian government and AMISOM…”—Report on Statements made by South African Ambassador to the United Nations Dumisani Kumalo, 22 May 2008. In the massive propaganda noise created by the US and Ethiopia, the truth was sufficiently camouflaged and resolution 1907 was adopted on Christmas Eve, 23 December 2009. The United States was and remains the principal architect behind the punitive sanctions that the UN Security Council imposed against Eritrea in 2009 and 2011 respectively. Eritrea, has been placed in the position of being presumed guilty and has been asked to disprove erroneous and unsubstantiated allegations made by Ethiopia and its handlers. Eritrea was asked to prove that it did not support terrorism, that it did not arm groups-specifically Al Shabbab in Somalia, that it did not have Eritrean forces “fighting alongside the ICU” etc. etc. The US-engineered sanctions are a continuation of the 12 year long policy of appeasement and legal attrition of the EEBC’s decisions, were transparent in their motives. They were orchestrated to give the regime in Ethiopia a win that it could not get in its US-backed bloody war of aggression and expansion, or through legal arbitration. The illegal, unfair and unjust sanctions should be seen in this context. The people and government of Eritrea categorically rejected the illegal, unfair and unjust sanctions resolution, but have nevertheless complied fully with its provisions. Since its inception, the UN Monitoring Group on Somalia and Eritrea (SEMG) has been subject to heavy criticism and the group has failed to substantiate its outrageous claims against the State of Eritrea. The fact is that it has not been able to come up with credible, verifiable evidence to support the outrageous allegations against Eritrea, is because there are none. So each time, the group has had to rely on manufactured evidence, faulty intelligence and hearsay to fulfill its mandate and produce its reports. Eritrea has dutifully cooperated with the Monitoring Group despite its strong opinions on the UN resolutions and has complied fully. The Monitoring Group said that Eritrea was the owner of a plane that made several trips to Mogadishu to deliver arms to insurgents there. That plane crashed in Uganda and it was owned by the United States. The Monitoring Group accused Eritrea of sending MANPADS to Somalia and produced pictures with “painted on” markers to make its case. The Ethiopians said that they were taken from Al Shabbab. The pictures were provided by US intelligence, but the MG has yet to explain how the MANPADS it claims were in Al Shabbab’s hands, remain in Eritrea’s possession today. The Monitoring Group accused Eritrea of attempting to bomb the African Union based on “evidence” provided to it by Ethiopia. It has yet to explain the many inconsistencies including why the Ethiopian Gemechew Alana, an Oromo, was presented as an “Eritrean General” in its report to the Security Council. 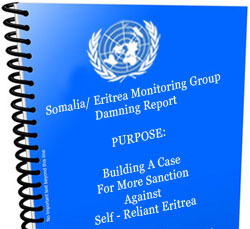 On several occasions, through its Statements and Reports to the Sanction Committee, Eritrea “sufficiently exposed the inexcusable follies and failures of the Monitoring Group”. Eritrea said that the “Monitoring Group has glaringly failed to observe minimum standards of objectivity and political neutrality and to discharge its duties with the professionalism and political independence that its mandate requires”. ii) The second category of sources of the Monitoring Group is “former Eritrean military or diplomatic officials”, again, what are the assurances that testimonies of elements who may be fugitive from the law or who may be fugitives from the law or who may be involved in subversive activities against the country are credible and not politically motivated fabrications? iii) The third sources are “active Eritrean Government contacts”. This provokes other deeper questions. 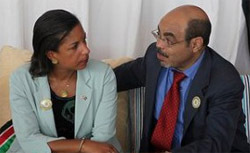 Is it lawful for the Monitoring Group to foster clandestine contacts with Eritrean officials? What are the financial or other inducements? And can testimonies of this type be considered valid? iv) The fourth category of sources constitutes “Eritrean individuals directly involved in people smuggling operations”. This is too preposterous to merit explanation. But that is how the Monitoring asserted in its Report that “a senior Eritrean Army General and the current Minister of Transport to the Sudan are involved in human trafficking”. Members of the Security Council have on more than one occasion also called on the SEMG to produce accurate and impartial reports. 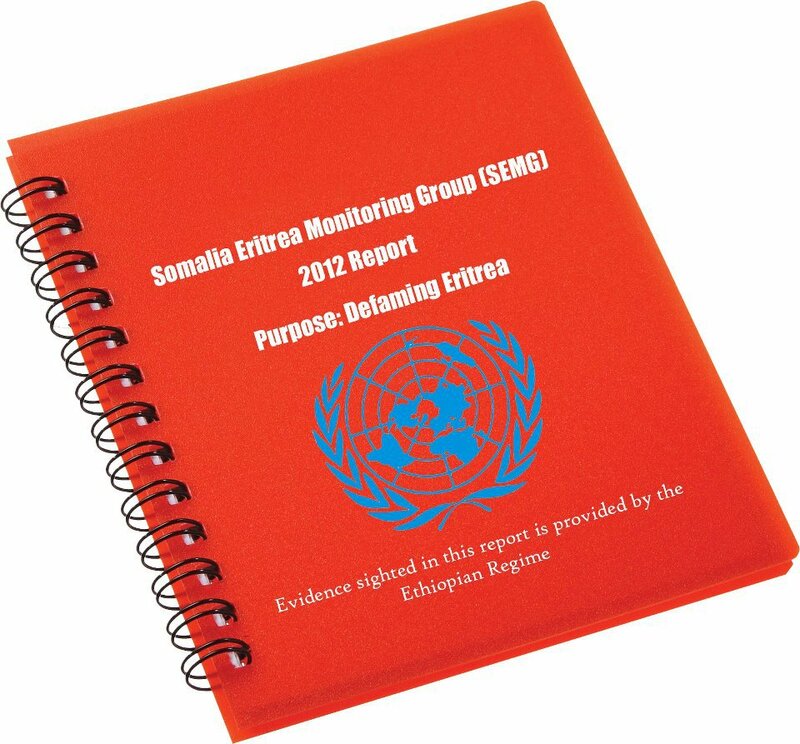 In the last 4 years, the SEMG reports have been withheld and not published because it contained erroneous allegations against the State of Eritrea and other member states,, but have been leaked to the press, think tanks and other US agencies, sullying Eritrea’s reputation and further undermining the confidence of the Eritrean people in the UN System. The individuals on the SEMG panel have been removed, but their tainted reports remain on the record. In a court of law “Voir Dire” is used to determine if the any juror is biased and /or cannot deal with the issues fairly, or if there is cause not to allow the juror to serve (knowledge of the facts, acquaintanceship with parties, witnesses or attorneys, occupation which might lead to bias, previous experiences, such as having been sued in a similar case etc. etc. adverse influence on a single juror compromises the impartiality of the entire jury panel, and in most cases, the judge will dismiss the case as the defendant will not be able to get a fair and impartial trial. At the UN, there is no such vetting, and from a cursory look at the personalities that make up the SEMG, it looks like it was individuals that could advance the pre-agreed upon agendas of the anti-Eritrea quarters, that were appointed to serve on the panel. Let us take a look at the members of the SEMG who have either resigned or were fired for misconduct since the SEMG’s inception. Two of the experts were gone and were replaced by others, however, the SEMG Report-a collective product- was not dismissed. Today, we hear about Dinesh Mahtani’s resignation, but he is not the only tainted member of the SEMG that has gone-Matt Bryden, Ghassan Schbley, Cornelis Steenken, Emmanuel Deisser, Aurélien Llorca, Jan Hendrik Van Zyl are former members of the Somalia Eritrea Monitoring Group who have either resigned, or were fired since its formation in 2010. The jaded Eritrean people have seen the many “Letters from the UN Secretary General to the UN Security Council” and the appointments he has made. Obviously, they all hand-picked “experts” tasked with the impossible-to find credible evidence to incriminate Eritrea. It should not surprise anyone as they have been tasked with doing the impossible-to implicate Eritrea in wrongdoing without getting their hands dirty in the process. How can they implicate Eritrea with fabrications, innuendos and hearsay without compromising their own integrities and credibility in the process? If this case against Eritrea were to be presented in a court of law, it would have been thrown out as there was no evidence to support the allegations, the evidence was manufactured, the prosecutors engaged in egregious misconduct that has compromised justice, mischaracterized evidence, used false or misleading evidence, introduced inadmissible or inappropriate evidence, and the jury has been tainted. If this case against Eritrea was presented in a court of law, the members of the UN Security Council’s Sanctions Committee and the SEMG panel would have been voir-dired to determine whether it could still render an impartial verdict based strictly on the evidence. But at the UN, they are subjected to unfettered access and influence, and most importantly, political pressure from the power wielding members, such as the United States. If this was a court of law, and the SEMG did not have the full immunity from lawsuits for the untruths it has propagates and the many defamations and character assassinations contained in its reports, it would have been held for libel and sentenced. The political agendas of the SEMG and its role in advancing illicit political agendas are becoming clearer with each report. The UN Security Council must remove the entire SEMG team as they have been tainted and cannot possibly produce an impartial, objective, neutral and credible report on Eritrea, or Somali for that matter. After almost 5 years, instead of firing and forcing the resignation of these “experts”, the UN Security Council ought to throw out the politically motivated case against the State of Eritrea and its people, and spare the UN system any further embarrassment. The rule of law must prevail over then law of the jungle! This entry was posted in Uncategorized and tagged Africa, African Union, Algiers Agreement, Asmara, Eritrea, Eritrea-Ethiopia Boundary Commission, Human Rights, Somalia Eritrea Monitoring Group, UN Security Council, United Nations Human Rights Council. Bookmark the permalink.